"The Birthday Party" is the 76th Mandrake Sunday story. The story was written by Lee Falk and drawn by Phil Davis. Magnon and Carola are expecting an heir and discussed various names for him, and Carola realized that Nardrake would be an acceptable name for a future emperor. The name was a combination of Mandrake and Narda, the two who brought her and Magnon together. Magnon accepted the name and they decided to bring Mandrake and Nard so that they could be their guests for the big event. Last time Mandrake and Narda visited Magna got all their memories of their visit erased from memory and stored on tape. On board the spaceship to Magna their memories of the galaxy was returned to them. Magnon had prepared for that a son would be born so he was a little confused when the child turned out to be a girl. It was a giant celebration of the newborn girl, where the scientists moved blue stars to form a new constellation. That would spell Nardraka for all time. When the time came for Mandrake and Narda to return home Magnon said they had to erase their memories once more. Since the planet Earth did not know the galaxy and no one there must be told. Carola asking if not the scientist could use the N9X process. A process where one did remember but was unable to tell anything about the galaxy, to someone who did not already know. Hubel, a scientist at Magna. A three dimentional photo of Nardraka, changing as the baby changes. A galactic watch operated by mind waves, think of any planet and it will show the correct time. 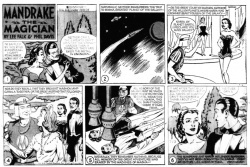 The story title is taken from the strip of July 6 and 13, 1958 (Next Week: The Birthday Party & Beginning: The Birthday Party).